How And Where To Buy Finacea Online? You can buy Finacea online through our Canadian International Pharmacy at huge savings. We offer RX and OTC medications online with a valid prescription from your doctor. At Canadian Pharmacy World, your health is our priority. You can place the order online, by mail, by fax or toll-free over the telephone at 1866-485-7979. 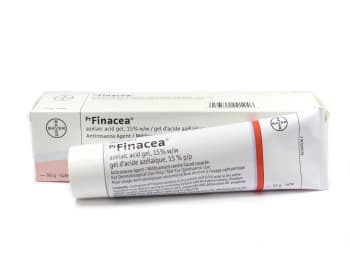 Are There Alternative Names For The Brand And Generic Finacea? Finacea gel is available from Canada and United Kingdom manufactured by Bayer Inc. We also carry the brand Finacea cream from Turkey also called Skinoren manufactured by Bayer. The generic equivalent of Finacea is Azelaic Acid and it comes from India also called Aziderm manufactured by Micro Labs Ltd.
What Dosages And Forms Is Finacea Available In? Finacea comes as a gel in the dosage forms of 15 %/30 g and 15 %/50 g. It also comes in the form of cream in the dosage of 20 %/30 g. The generic equivalent of Finacea comes as cream in the dosage form of 20 %/15 g.
What Is Finacea Used For? Finacea is used for the treatment of rosacea (when the skin on the face is unusually red). It belongs to the class of skin medications. It is believed to act by reducing the production of substances in the body which cause inflammation such as cathelicidin, kallikrein, thereby reducing the inflammation of rosacea. This medication is for topical use only. The safety and efficacy of this medication have not been established in children and adolescents. What Are The Possible Side Effects Of Finacea? Some of the common side effects that can occur on treatment with Finacea include skin irritation usually at the start of treatment, burning, stinging, tingling, or itching sensation, reddening, skin dryness and scaling. Some other side effects include allergic skin reactions, infection of the hair follicle, hypersensitivity, hives, unusual changes in skin color. These are not all the possible side effects of Finacea. In case of any unexpected effect, contact your healthcare professional immediately. Are there any Precautions and Drug interactions for Finacea? Avoid contact of Finacea with the eyes, since it might irritate them. In case of accidental contact of Finacea with the eyes, inside of the nose, or mouth, wash your eyes, nose or mouth immediately with large quantities of water. Avoid spicy foods, hot foods and drinks, and alcoholic drinks, since these may make rosacea worse. Do not take Finacea if you are allergic to azelaic acid, propylene glycol or any other non-medicinal ingredients in Finacea. The drug should be stored at a room temperature of 15°C to 30°C. It should be kept out of the reach and sight of children.